By government standards, butter quality is rated on a scale of 100, reflecting its flavor, body, color, salt content, and packaging. The product is graded AA, A, B, or C. A score of 93 or above is rated AA. B and C grade products are used only in baking and food processing. The best-quality butter is composed of 80% fat and 12 to 16% water. Lightly salted butter is the kind most often used in general cooking. This type of butter is used in cooking and as a table butter by those who enjoy its subtle flavor. It has a mild, slightly tart taste. 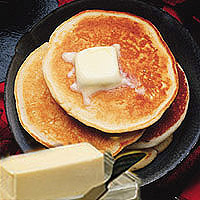 Sweet butter is used in cooking to create special effects, such as extra-light, flaky pie crusts. It can be used to garnish toast or bagels, and to season vegetables, just like salted butter. For those who must watch their salt intake, sweet butter is worth considering. A pat of salted butter contains about 41mg of salt, whereas a pat of sweet butter contains less than 1 mg. This is butter that has been whipped with air to make it light and fluffy. It is packaged in tubs and used as a table spread. Because of its air content, it is less dense than solid-type butters—by comparison, its weight (and also its fat content) are reduced by about a third—yet the basic flavor is retained. Many products are now available that combine butter with vegetable oils that are lower in saturated fat. This is a rich form of butter, made from cultured cream. It is popular in Europe and is now being produced in the United States; it is available in most regions of the country. Clarified butter retains only the fat content of butter, not its milk protein and solids. As a result, it burns less readily when used in sautéing and baking.